Rich widow Sophie Hostetter is more than a cancer patient to Rose. She's become a beloved mentor to the young nurse. When a car bomb kills Sophie, Rose seeks comfort in Jake. Can he help her while he's struggling with his own past? About "The Palisades: Decision (Palisades Pure Romance Series)"
Rose Martin, fearless young nurse, cares for the critically injured. But when a car bomb explosion kills her cancer patient -- rich widow and beloved mentor Sophie Hostetter -- Rose faces a difficult question: Who could have done this? Was it Peter, Sophie's financial risk -- taking son? 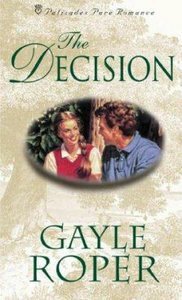 Rose escapes into the arms of Jake, a man struggling with his past and his Amish heritage, yet decisions come hard in matters of love and forgiveness. Can the living find God's forgiveness for themselves and justice for the dead? Rich widow Sophie Hostetter is more than a cancer patient to Rose Martin---she's become a beloved mentor to the young nurse. So when a car bomb kills Sophie, Rose seeks comfort in the arms of Jake. But can Jake truly help her while he's struggling with his own past and his Amish heritage?